Morning and afternoon walks are my main form of whole-body exercise. I like to do a total of at least five mies each day, divided about equally between the two walks. One of my favorite morning walks takes me through Eastwood Park. 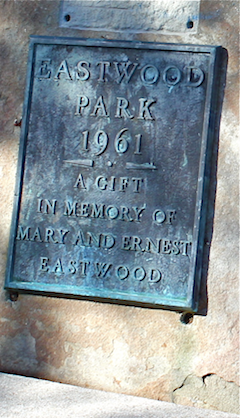 Ironically, Eastwood Park is on the border of an area commonly referred to as the “West End” of town. One entrance is beside a small parking lot at the “top” of the park, which is atop a small hill rising abruptly from Main Street. One can drive up Cedar Street to the parking lot, but I (almost) always walk to the park. On my way up to the park I usually go up Wall St. (NO, not THAT Wall St.) which passes by numerous quaint, old houses that illustrate what a quarter million dollars can buy in these parts, these days. 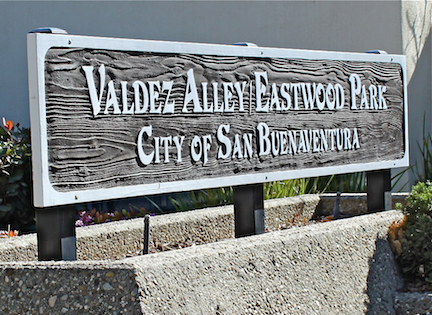 The South Entrance: The pathway to the South Entrance to the park from Main St. is called Valdez Alley, which runs perpendicular to Main St. The Valdez Alley path to the park passes beside some condos, and up a gradual incline . . .
. . . until the alley ends at stairs leading to the various levels of the park. 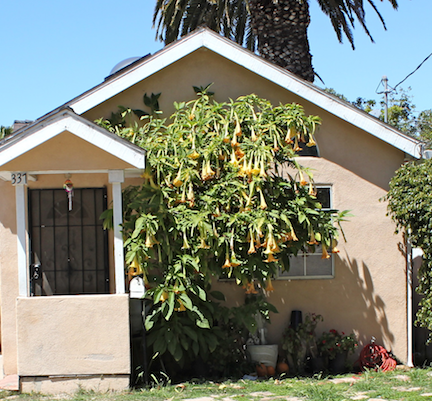 The path to the West Entrance runs perpendicular to Ventura Avenue, which is the dividing line between East and West addresses. 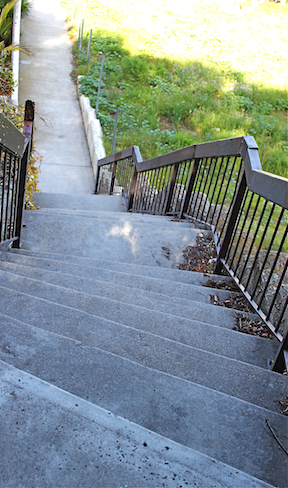 The stairs up to the park are quite steep, as you can see in the photo, below, showing the view from the top of the stairs. One of the most interesting attractions of the park is a very old building with an interesting history. A poster beside the building, shown below, contains a brief history of the building. 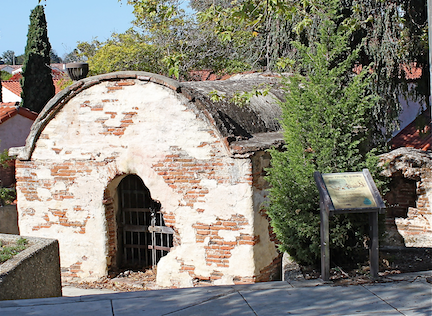 “This is one of three water filtration buildings in the California Mission System, and is the oldest standing structure in Ventura County, California. The building served as a jail in the late 1800s, but now it stands as an example of the architectural and engineering accomplishments of the Mission Period. Built in 1782 by indian slave labor under the direction of father Pedro Cambon, this water filtration building was part of an extensive water system. 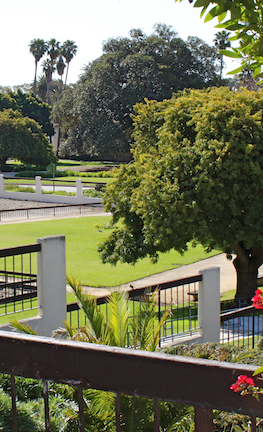 It furnished Mission San Buenaventura with water until the aqueduct from the Ventura River was destroyed by floods in 1862. Water flowed into the interior basin, where debris settled out. 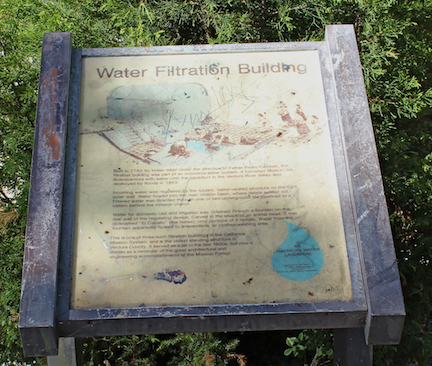 Filtered water was directed through one of two underground tile pipelines to a cistern behind the mission church. Unfortunately, recent budgetary problems have caused this fine little park to fall into disrepair. 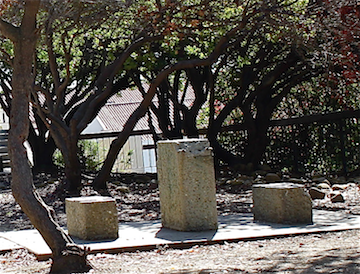 For example, vandalized benches and tables have not been repaired or replaced, but simply removed, leaving only the concrete supports, as shown in the photo below. Fortunately, the plants still thrive, and blossom as always . . . The park is set in the midst of a fine graded which is not a part of the park itself . . . 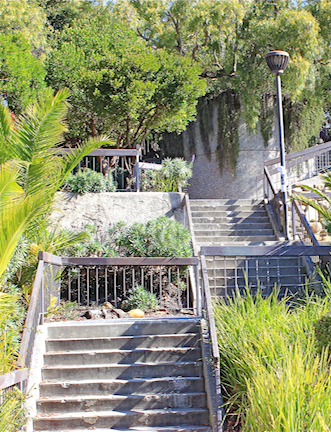 This entry was posted in Walking Pathways and tagged Mission San Buenaventura, Spanish missions in California, Ventura County California, Ventura Pathways. Bookmark the permalink.